“I would urge people to stop at the stall. Support and advice to help carers cope with their role is already making a difference at Morriston Hospital. 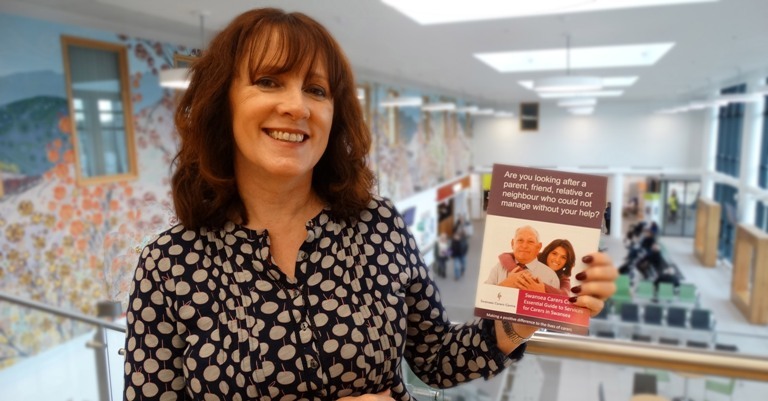 Karen Keey, from Swansea Carers Centre, has been manning an information stand in the hospital’s outpatients department every Thursday to offer guidance and practical advice. “We want people to realise they are not on their own,” said Karen (above). But Karen said anybody who is offering care or support could benefit from having a chat with her or Liz, who will be spending one day a week at Singleton and half a day each at Cefn Coed and Gorseinon. She said the number of known carers in Swansea alone would fill the Liberty Stadium and still leave 9,000 people queuing outside. “If you think you are a carer come and see us, we really can help. It may be a case that there are benefits you are eligible for – and if so we can help you fill in the right forms – or we might be able to give you a chance to talk to other people in the same boat,” said Karen. Her role at the hospital is being funded by ABMU’s Changing for the Better improvement programme and it also sees her building up links with ward staff who can tell patients and their carers about the service. Karen regularly attends ward managers’ meetings and has been working with the hospital’s new PALS team as well as specialist support groups connected to Morriston. “Life can change so quickly. Many people reading this may not be carers at the moment but they may be in future. “Hopefully if we look after carers we can help prevent them getting worn out and reduce admissions to hospital so this is not only beneficial to them but also to health services,” she said. Someone who has taken advantage of the advice Karen offers is Lynda Twill, of Dunvant, who spotted the stand while she was at the hospital with her husband John who has been diagnosed with oesophageal cancer. “I wanted to see if they could point me in the direction of support should we need it in the future. It makes a big difference to me to know that help is out there. Lynda said she hadn’t been aware of the carers centre before meeting Karen. “You tend to fall into becoming a carer, it’s not something you plan and there is so much you don’t know about so it is definitely helpful to find information. Swansea Carers Centre provides various support including free holistic therapies, specialist help for young adult carers and offers a Caring Break service to give them a rest.